Welcome Aboard The True North-Celebrating 30 Years in the Kimberley! The highly acclaimed TRUE NORTH allows discerning adventurers to experience wilderness in surroundings in line with a personal luxury mega yacht that would look as at home in the world’s most exclusive harbours as it does in the Kimberley. Guests are able to take advantage of a number of stylishly appointed vantage points including a sundeck, a forward observation lounge, a ship’s lounge and an alfresco bar. The ship’s naturalist presents interpretative information on plasma screens and, an internet café enables convenient communication with the outside world. A popular venue on any True North cruise, the lower deck dining room offers the ultimate in comfort and uninterrupted vista – large panoramic windows ensure that guests never miss any of the action, even when they are enjoying the ‘finest in fine dining’. All cabins feature stylish décor, en-suite facilities, in-house entertainment and satellite telephones. The Explorer Class staterooms and the River Class cabins offer king size beds that can be converted to singles and the Ocean Class twins feature roomy single beds. Rates above are per person standard published fares and DO NOT INCLUDE specials, discounts or reductions exclusively available through Kimberley Cruise Escapes. Check out our Specials page or just Call toll free 1800 000 130 for current specials and availability. Other features include large panoramic windows, a complimentary mini-bar, in-cabin entertainment and satellite telephone. Located on the middle deck – River Class cabins feature a king size double (that can be converted to singles) and en-suite. 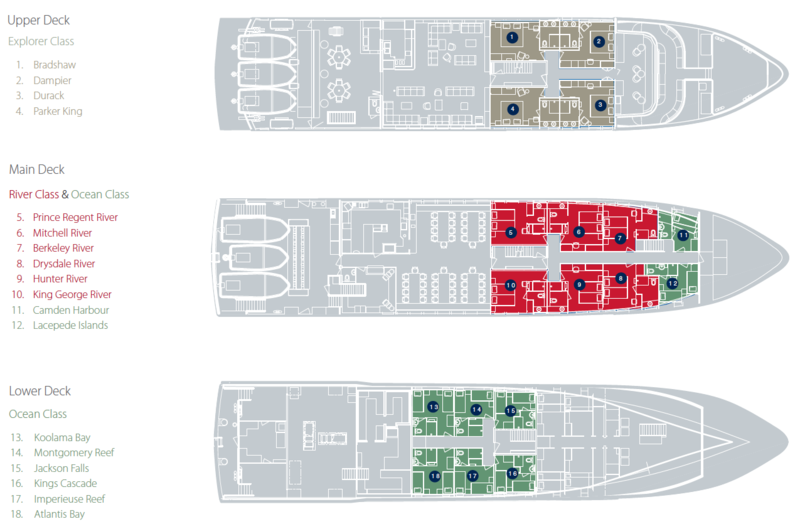 Cabin size is similar to Explorer Class. Modern Australian cuisine is featured. Dining is a stylish but casual affair. Seating is not assigned. Hors d’oeuvres in the ship’s lounge is a not to be missed daily event! Keep an eye out for succulent oysters (which you almost certainly helped to collect) and sashimi caught just hours before. Signature dining includes freshly caught barramundi – a revered sport fish possibly caught with your very own hands, or perhaps aged Angus or delicate Wagyu beef, or exquisite Australian lamb! Our ‘heli-picnics’ are an unforgettable way to enjoy the quintessential Aussie barbeque featuring a wide variety of seafood including freshly caught reef fish, local king prawns, squid, pearl meat and smoked salmon. Our Seven Seas in Seven Seasons calendar presents an array of species to challenge fisherpersons of every calibre. You will be presented with convenient opportunity to do battle with some of the world’s most revered sports-fish. The iconic barramundi, the elusive mangrove jack, finger mark bream, golden snapper, jewfish, pink snapper, delectable whiting and even the mighty sailfish are all on the agenda! With six expedition vessels (not zodiacs) accompanying the True North, guests have greater opportunity to do “what they want, when they want.” The luxury of so many dedicated expedition boats means that we can always allocate craft to different fishing styles and to varying degrees of experience. Fish in comfort and receive the individual attention that the True North is famous for. The ship’s helicopter also adds unique dimension to fishing on the True North. Heli-fishing is one of our most popular activities – fly over stunning wilderness in air-conditioned comfort to an otherwise inaccessible location! Who could pass up the opportunity to fish where perhaps no one has fished before? The True North carries a full complement of high quality fishing equipment on all cruises. Rods, reels and hand lines are provided for your complimentary convenience however keen anglers are welcome to bring their own gear (6-8kg bait casting outfits are recommended). Lures are available on a replace if you lose basis. Our chef’s love to be a part of the fishing action – when the ‘hunters and gathers’ return to their home away from home, the chefs will delight in preparing a lunch or dinner that truly reaps the rewards of your efforts! Our chefs particularly enjoy mud crabbing – not only will they show you how to prepare unforgettable fare; they will also be right by your side when you battle these cantankerous adversaries! Who can, you can! From the “never fished” to the “I’ve caught ‘em all”, our guides encourage all onboard to join in the action and multiple expedition boats always allow opportunity to enjoy a wide variety of fishing styles in small groups of equal ability! Everyone on the True North is conscious of the fact that fishing in a wilderness area is a privilege. The True North is fully licensed for fishing and fishing regulations are strictly observed. We never take more than a ‘taste’ and fishing operations are always conducted with the utmost care and respect. Wherever possible we practice ‘catch & release’ techniques and, we never permit any activity that might degrade fish habitat. Adding yet another dimension to adventure, most cruise options on the TRUE NORTH also feature an onboard helicopter! Carrying guests in air conditioned comfort, the ship’s helicopter provides unique opportunity to witness grandeur; unique opportunity to fish billabongs that have never been fished; unique opportunity to discover your very own wilderness! Now it’s not uncommon for our guests to embark with some uncertainty about flying in a helicopter – however it’s always a different story when the time comes for disembarkation. The ship’s helicopter helps you to climb mountains and volcanoes in air conditioned comfort. Even if you are not as spritely as you once were – the helicopter will deliver you without fuss to even the most inaccessible locations. See ancient rock art without leaving your seat. Glide over impenetrable jungle and swoop on historic and cultural highlights. Take someone special on a sunrise flight or join the entire guest compliment for an unforgettable heli-picnic. The ship’s helicopter – another TRUE NORTH icon! The light, single-engine Eurocopter 130 B4 is the quietest, most spacious helicopter available on the market. The ultra-quiet EC130 B4 integrates the latest technological advances of EUROCOPTER’s new generation helicopters. It has a maximum gross weight of 2.4tonnes, and offers an enlarged cabin, allowing comfortable accommodation for the pilot and 6 passengers on individual leather seats. With air-conditioning and large cabin windows, it is perfectly suited for getting those spectacular aerial shots and exploring the many destinations that are on offer with North Star Cruises Australia. Heli-operations are run by Rob Colbert, Chief Pilot of Skyhook Helicopters Pty Ltd. Rob has been working in and flying around the Kimberley region for over 23 years, and has been working with TRUE NORTH since 1996. He has a keen interest in fishing, local history and culture, and provides entertaining commentary on all flights! Or you may be lucky enough to have Rainor Marshall or Will Stinson as your pilot, both experienced and very knowledgeable in their own right! Spectacular Eagle Falls Helicopter flight!Explore by sea and air aboard TRUE NORTH! Enhance your cruise experience with a heli flight direct from the deck of TRUE NORTH! Waterfall exploring! Fly to a secluded location and relax with an afternoon of swimming and exploring. Take the Heli to an exciting hilltop location and watch the sun sink into the ocean. Exploring hidden waterfalls with your very own helicopter! Click here to view all True North Kimberley Cruise itineraries. Kimberley Cruise Escapes presents True North Kimberley Cruises. Escape to the Kimberley on the 7 day wet season adventure, 10 day Kimberley Snapshot or 13 day Kimberley Ultimate aboard the True North. Keep an eye on the Kimberley Cruise Escapes current best deals for the latest True North deals.